A floating terminal, retrofitted from a car ferry, is slated to serve passengers going to Manhattan and the Jersey Shore. In April of 2018, Bayonne officials formally announced that SeaStreak, a private ferry operator based in Atlantic Highlands, would soon be making stops on the southern shore of the former Military Ocean Terminal on its way to Manhattan, starting in the spring of 2019. Spring is here. But the ferry isn’t. Now officials have pushed the timeline to late this summer or early fall. Creating a ferry terminal on land is no walk in the park. SeaStreak has decided to use a 280-foot floating car ferry, retrofitted to include a ticket booth, as its terminal, then to wait and see if ferry service demand warrants the cost of building a full-blown structure on land. 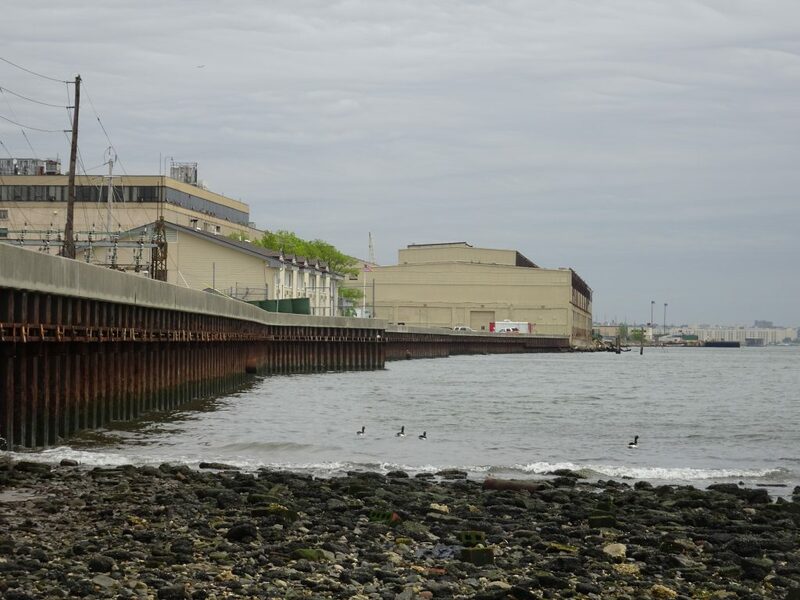 That land, owned by the Port Authority of NY and NJ and leased to Bayonne for $2 million over a ten-year period, will be used for parking, which is expected to come for ferry passengers at no added fee. Passengers will enter the permanently moored, floating terminal to wait for the ferry and then enter the ferry via a gangway. “The car ferry won’t even have an engine. They’re taking it out,” said Bayonne Special Projects Engineer Andy Reichtl, who leads the ferry project. Because a car ferry is designed to accommodate passengers and their cars over long distances, it has all the amenities necessary for a terminal: plenty of space for a waiting area, bathroom facilities, and a food vendor. SeaStreak has to install a ticket booth. The regulatory ease of building a floating terminal as opposed to a land terminal is only a side benefit, not the full reason. SeaStreak seems to be taking the cautious route instead of diving straight in. The company has a similar system for its terminal in Atlantic Highlands. Coincidentally, Reichtl commutes to Manhattan from Atlantic Highlands. That terminal includes valet parking, which wasn’t included in the Bayonne proposal. The voyage is about 25 minutes. In early 2018, SeaStreak responded to a request for proposals issued in April of 2017 for a ferry provider. The same month, the city secured a $650,000 federal grant for dock construction on the terminal. The grant is part of $58.2 million in Federal Transit Administration grants distributed to 20 passenger ferry projects in 12 states. In the bid, SeaStreak proposed offering 13 round trips at intervals of about 30 to 40 minutes on weekdays between Bayonne and Pier 11 in downtown Manhattan. The price of a one-way ticket would be $13, and $25 for a round-trip ticket. On weekends SeaStreak would offer four departures a day, two in the morning and two in the evening. Prices for seniors and military personnel would be $9 for a one-way ticket and $18 for round trips. A bulk monthly package of 40 trips would cost $415.50. Included in the price would be a complimentary transfer to ferries going to 35th Street and a bus shuttle from Pier 11 to the World Financial Center. SeaStreak would start its service with a ferry capacity of 149 passengers and may increase that capacity to 500 if demand warrants it. Seasonal weekend trips from Bayonne to Sandy Hook National Park Beach; West Point, New York; and other Monmouth County destinations were included in the proposal.